When making API requests from your AWS or Azure environment to a partner or customer, the receiving server may have a firewall with a whitelist of allowed IP addresses. If that is the case, it is often better to provide a small set of known IP addresses that you will be making requests from to make it easier on the IT team on the receiving end. This is especially challenging to do if you have instances or containers in multiple VPCs/VNets spread out across a region (which is often the case as multi-VPC architectures become more prevalent). Out of the box, you will most likely be required to provide a new IP address for every VPC or VNet. However, with Aviatrix, you can narrow the outbound VPC traffic to just a handful of IP addresses. Setting up a working solution with Aviatrix is quick and easy. See the diagram below for the details on the solution. For this design, we use an Aviatrix Gateway in each of the VPCs where the requests are originating. In the above picture, those requests orginate from “workers1”, “workers 2”, and “workers N” VPC. In addition, we install an Aviatrix Gateway in an “egress” VPC with an IGW connected to the internet. Each of the worker VPCs is connected with the egress VPC via a secure tunnel. Traffic destined for the partner network goes out that tunnel, to the Aviatrix Gateway and on to the internet via the IGW. As the packet leaves the NAT-enabled Gateway, it uses the EIP. On the partner side, the firewall can use the EIP(s) in their firewall to white list incoming traffic from your network. A shared services VPC where the Aviatrix central controller will be installed. AWS account credentials or the ability to create new IAM roles. This is how the Aviatrix Controller will connect to your AWS account. A separate “egress” VPC with a public subnet connected to the internet via an IGW. A list of “worker” VPCs where requests will orginate. If you have already installed an Aviatrix Controller, you can skip this step. Create a new VPC or VNet with a public subnet connected to the internet. Follow this AWS guide for more details. 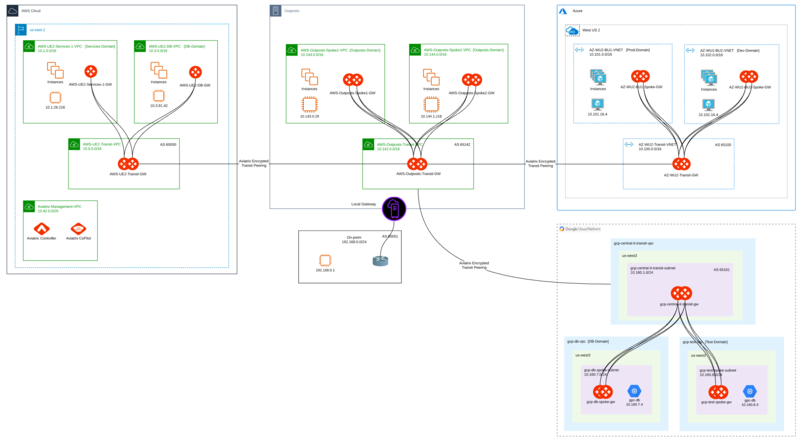 Next, create a Gateway in each of the VPCs/VNets where the requests destined for the partner network are originating. Each of the worker VPCs/VNets must have a public subnet to allow the Gateways to communicate with each other. Nothing else needs to be in the public subnet other than the Gateway. All that is left to do is to peer the worker VPCs/VNets with the egress VPC/VNet.